EULAR/PARE will be invited to contribute to the training and Science Cafes. The European League Against Rheumatism (EULAR) is the organisation that represents the patients with arthritis/rheumatism, health professional and scientific societies of rheumatology of all the European nations. PARE are the national organisations of People with Arthritis/Rheumatism in Europe. Investing in the future: (secondary school) students and teachers. Research fellows make teaching material (e.g., presentation, computer lab) for secondary school students and their teachers. The fellows will use the teaching material at a local secondary school to enthuse students for systems medicine. Additionally, COSMIC results will also be included in university bachelor/master and company training programmes. Best exposé written for lay public. At the end of COSMIC during the 4th Annual Meeting, we will award a prize for the best systems medicine exposé written for lay public. Scientists from inside and outside COSMIC will be invited to participate. COSMIC will put effort into having this expose published through a wide range of channels that reach the general public (electronic and newspapers). Rerun by popular demand. Bastien of PLANT.ID did so well last time high school students visited the labs at the Center for Research and Technology Hellas (CERTH) that they decided to do it again! 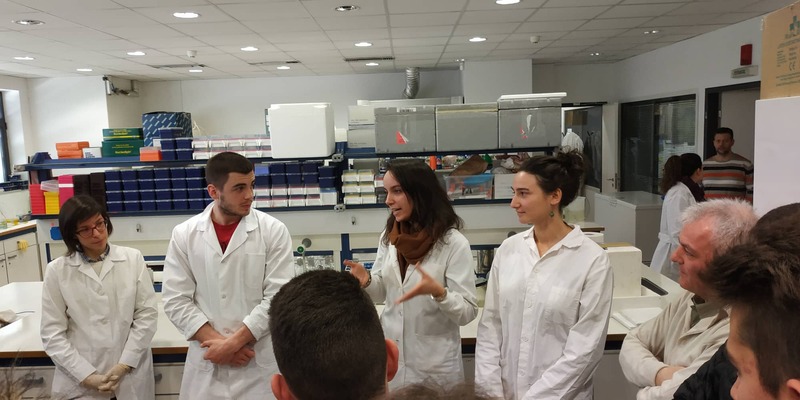 This time he teamed up with Laura Zaragoza Infante, an ESR of COSMIC and they shared their experiences of being part of a Marie Skłodowska-Curie Actions project. Got to love inter-ITN fraternization.